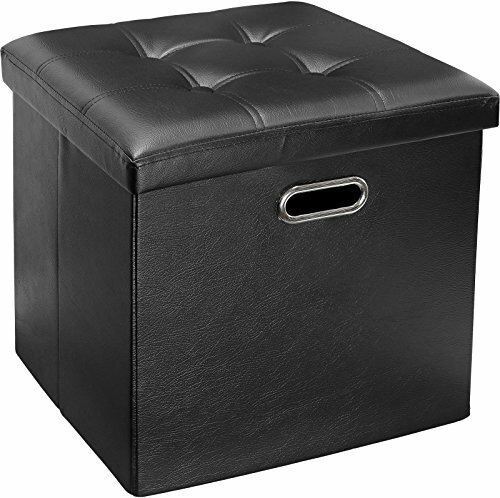 This Ottoman Stool is an ideal addition to your living room, playroom, dorm room etc. Its versatile use as a storage box for clothes to games, toys, art & craft supplies and more. Also for an extra seat whenever needed. Its tufted high cushioned seats makes it as comfortable as it gets! with adding style to its design!. Easy to set up when using and collapses flat when not in use for easy storage. Dimensions in inches; 14” H x 14” W x 14” L. Weight capacity of up to 250 lb. Made of high quality durable, easy to clean, waterproof, black faux leather. Tufted, nail headed, high cushioned seat for maximum comfort. Can be used for an extra seat. Easy to set up when using and collapses flat when not in use for easy storage. Dimensions in inches; 14" H x 14" W x 14" L. Weight capacity of up to 250 lb.